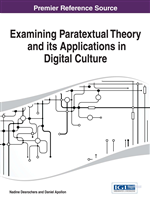 Intertext and paratext are central to the creation of fantexts and fan communities. It is essential therefore to explore how intertext and paratext affect the production and consumption of fanfiction, which involves the communication of the reader and author. In this chapter, the authors examine one fanfiction platform as a case study using the Fifty Shades of Grey enterprise as a contextual pivot point in order to understand the impact of digital paratext and intertext as tools constructing the medium of fanfiction. Using computer-mediated discourse analysis, the authors explore textual elements of three fanfiction titles, focusing on the paratext, the reader and author interactions, and the intertext, here the relation of the fanfictions to Fifty Shades of Grey and other texts, including those published on the same fanfiction forum (Fanfiction.net). Findings indicate that fanfiction not only includes paratextual elements for author-reader communication, but also that paratext is integral to the creation of fanfiction. As fanfictions evolve, they themselves become intertextual root-texts from which new fanfiction develops. Gérard Genette (1997) describes the power of paratext by writing that “the paratext is what enables a text to become a book and to be offered as such to its readers and, more generally, to the public” (p. 1). Rarely, as Genette notes, is the text proper presented unadorned, without paratextual utterances accompanying it (p. 1). This perspective on paratext which focuses on the physical book clearly illustrates that paratext is established as an essential tool, or exists as infrastructure, as part of the textual creation or writing and reading experience. As such, this tool can be applied to non-physical or digital spaces. The elements of paratext—peritext and epitext—are located inside and outside of the text, respectively, and share its spatial field (Genette, 1997). Peritextual inclusions, such as titles, certain notes, and dedications, are located within the text, whereas a more distanced inclusion, epitext, originates outside of the text. Genette’s explanation of epitext gives interviews, conversations, and private communication tools such as letters or diaries as examples, as all of these would be separate from the physical book, but linked to it through its own peritextual force.